Kuumletid toiduainete soojas hoidmiseks lõhiajaliselt, Digitaalne kontroller, erinevad pikkused, sisevalgustus, erinevad riiulitasapinnad. Georgia III 1000 hot belongs by its style and design to the Georgia III range of products. These luxury heated cabinets are intended for the presentation and sale of packed and warm goods. Under each glass shelf there is a fluorescent light which increases the attractiveness of the displayed goods. All glass panels are made of insulating and tempered double glass. For easy access, sliding doors are fitted in the back part; hinged curved front glass is designed for easy maintenance. The operation of the showcase is controlled electronically. The model series Square belongs to the widespread category of Georgia pastry cabinets. Its design addresses customers who want to atract people by unusual way. The combination of stainless steel, double-thermo-insulating glass and straight aspect of the Square models sets it apart from the common units with rounded shapes. 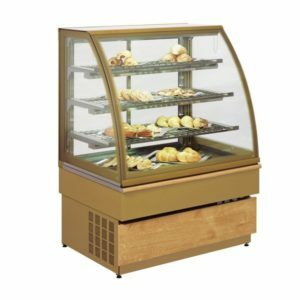 These showcases are intended for sale of confectionery and pastry products. Model range consists from cold, hot and neutral variants. Under each shelf there is a fluorescent light, which increases the attractiveness of displayed goods. 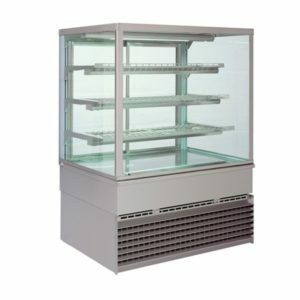 COLD model has glass shelves, the HOT is provided with grids. All glass parts (excluding shelves) are made of thermo – insluating double glass. Rear sliding doors provide easy access to the unit. The showcase is controlled automatically by the electronic control unit, including automated defrosting. Perfect cooling of the COLD model interior is provided by forced air circulation. 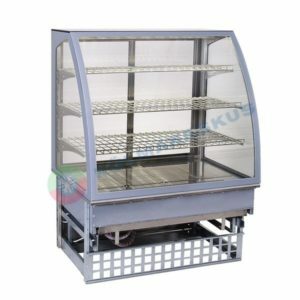 To avoid drying of displayed products the HOT model is equiped with a water tank at the bottom. The heating elements positioned above this tank are causing slight evaporation of water into the exhibition area – remoistening. The Square series is equipped with casters for better handling. The rear wheels have brakes. The elegant model line Virginia is extended by the HOT version now. This showcase brings modern slution to any fast food, restaurant, fuel station and so on.